An Open Turbo Is A Dangerous Thing! Don't Destroy Your Car! An Open Turbo Is A Dangerous Thing! Don’t Destroy Your Car! Do you think about having an open turbo on your car? Well, that might not be a good idea! Working on any vehicle is always such pleasure hence you put your effort in to produce something unique. Even though many of us are not professional mechanics, we like to touch things up and fix any type of problem on our own which is probably due to the fact that we want to save couple of hundred dollars. But sometimes mistakes are inevitable and are prone to happening when working on such projects of modifying your ride. Hereby we take a look at this awesome video and we see what can happen if you put your car on the dyno with an open turbo. Something unbelievable happens and none of us would expect that. 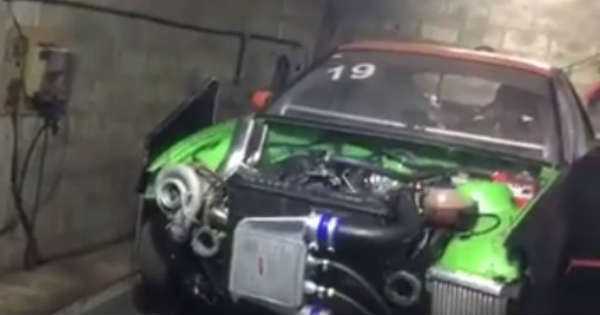 This guy took his awesome ride to the dyno to get a little bit of tuning but little did he know that he was about to completely destroy his car. As most of you know, an open turbo creates so much suction power and hereby you should avoid staying close to one when running at high RPMs. This is exactly where these guys made a huge mistake and instead of moving away all of the object that were standing close to the open turbo and the car, they did not do it. So when the car was going very hard on the dyno with great power, the massive suction created by the turbo caused the rag to be sucked in it. They immediately stopped the test and noticed that they made a massive mistake! At last, check out this Turbocharged BMW M3 E36 doing some awesome donuts!